When you talk about Loon Lake most people instantly think of it as the starting point for world famous Rubicon Trail, but it’s much more than that! 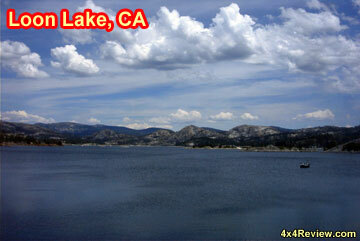 Loon Lake located in the Sierra Nevada mountains is actually a great place to go fishing, hiking or camping for the day. 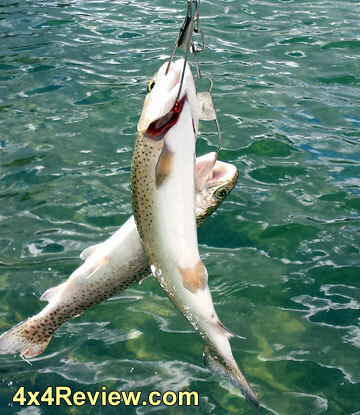 The fishing is normally amazing all day long, even in the middle of the day we always seem to catch many trout.Due to the elevation of Loon Lake which is 6500ft you don’t need to wake up at the crack of dawn to catch fish. We usually have the best luck between 10am and 2pm, which is strange coming from fishing in the Sacramento Valley where earlier seems to be better. 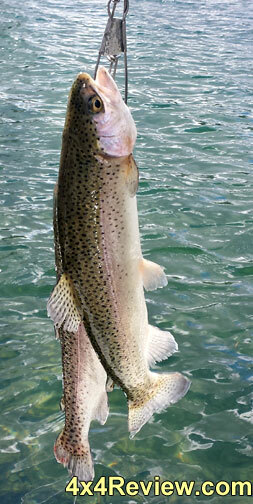 Here are a couple pictures of the trout we caught on this trip. We normally use Power Bait or Castmaster lures to catch the trout, and by mid day we’ve got enough for lunch or a feast of a dinner. We have equal luck fishing from the shore or from a boat. It can be cold in the morning until the sun comes over the mountains so go prepared for frost, and frozen slipper ground. 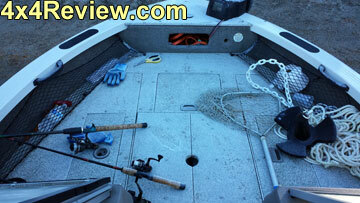 As you can see the boat is covered with a thick coat of ice and frost. This was around 7am too, so not that early. Next up is cooking the trout! We keep it simple. Clean the fish, throw in a good helping of coconut oil inside with sea salt, wrap in tinfoil and let sit over coals or a bbq on low. The end result is usually super moist, tender trout that the skin and bones literally pull apart. The only problem is sometimes there’s too many fish to fit on the BBQ!! 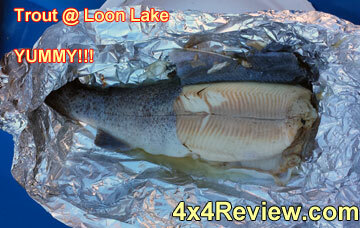 All you need is a fork to enjoy this fresh trout! Next Can I take my trailer on the Rubicon Trail?